Howdy, peeps! Naked Cowboy and I are going to run off together and leave the busy city lights of Times Square behind to have hippie cowkids. Just kidding — kind of. Today I’m excited to introduce you to someone you probably already know pretty well. Her name is Dorothy and she blogs over at Crazy For Crust. I know I’ve told this story approximately 731 times, but for the 732nd, Dorothy is my neighbor back home in California and we frequently get into shenanigans together. I tried packing her on my carry-on and TSA was like, “ma’am, I’m sorry but you cannot transport humans onto the cargo of the plane.” It was depressing. Anyway, be sure to check out Dorothy’s blog because she constantly makes delicious concoctions like these Brownie Gooey Bars (seriously gooey) and these Peanut Butter Butterfinger Blondies, which are a lot like some donuts we had in San Jose a couple months back. So let’s roll out the yummy pie crust carpet for Dorothy!! Hello Domestic Rebelers! I’m Dorothy from Crazy for Crust. I’m filling in for Hayley today while she whoops it up in NYC and I’m so super jealous. I mean – Hayley is my neighbor. She lives about 3 blocks from me. Where was my NYC invite? Hmmmmmmm Hayley??? So obviously everyone else in the world knew where Hayley lived, except me. I’m obviously a very observant person. You know what I am observant about? Dessert. I’m all over dessert. It’s kind of what I do – my blog is a baking blog served with a slice of my life, which means I post dessert recipes and talk too much. I’m bringing you my favorite blondie recipe today. I’ve used this blondie in several recipes but my favorite are the Caramel Crunch Blondies. Those have crunch bars and caramels. These? These have Reese’s Pieces. 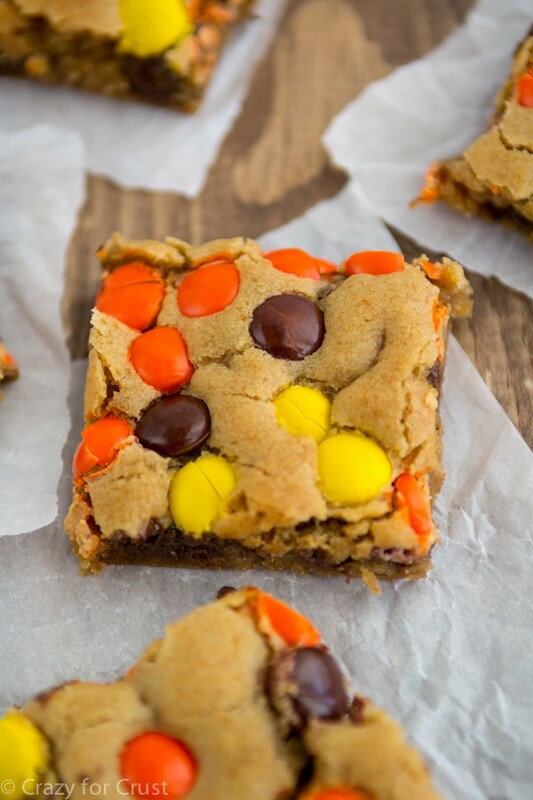 Peanut Butter + Blondies = best dessert recipe ever. The only difference between my normal blondie recipe and this one is that I use brown butter. (Or is it browned butter? I never know.) If you don’t know what brown butter is, here’s the scoop: it’s butter that you melt and cook over low heat until it turns brown. Browning it gives the butter a richer, nuttier taste with much more depth than just plain old regular melted butter. That, in turn, gives the blondies a more toffee-like and richer flavor than regular. That, again, is a win. If you’ve never browned butter before and aren’t sure how to do it, no worries. I wrote a post on how to brown butter. It’s really easy to do. I love using it in brownies, cookies, cakes, frosting – you name it! You must try it. If you've never browned butter before, you MUST try it -- it gives desserts a wonderful caramelly, nutty depth of flavor -- and these Brown Butter Blondies from Dorothy at Crazy For Crust are no exception! A must-make! Preheat oven to 350°F. Line a 9x13” pan with foil and spray with cooking spray (or just grease it, the foil is for easy removal). Slice butter into thin slices and place in a heavy-bottomed saucepan over medium-low heat. Melt, stirring often, until it browns. It will foam up and while you’re stirring you’ll notice the butter has turned a dark amber color. Do not walk away from the pan, it burns easily! Remove from heat. Cool 5 minutes. Place brown butter and brown sugar in a large bowl. Stir to combine using a wooden spoon or a spatula. (You can also use a mixer, but it’s not needed.) Stir in eggs, one at a time, then vanilla extract, salt, and baking powder. Carefully stir in flour. Add 1 cup of mix-ins. 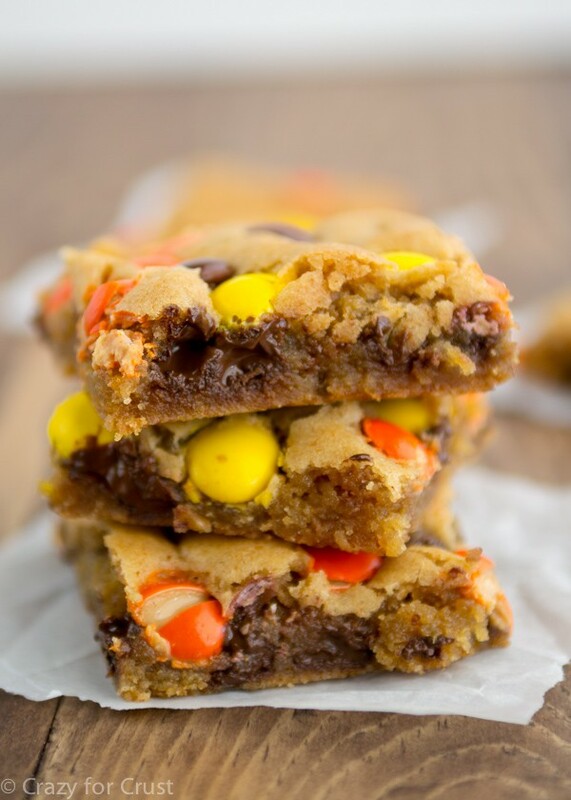 You can use anything you like: chocolate chips, chopped candy, M&M’s, etc. I used semi-sweet chocolate chips. Press dough into prepared pan. The dough is thick and sticky, so spray your hands with cooking spray to avoid it sticking to you. Add ¾ cup of remaining mix-ins to the top and lightly press to adhere. 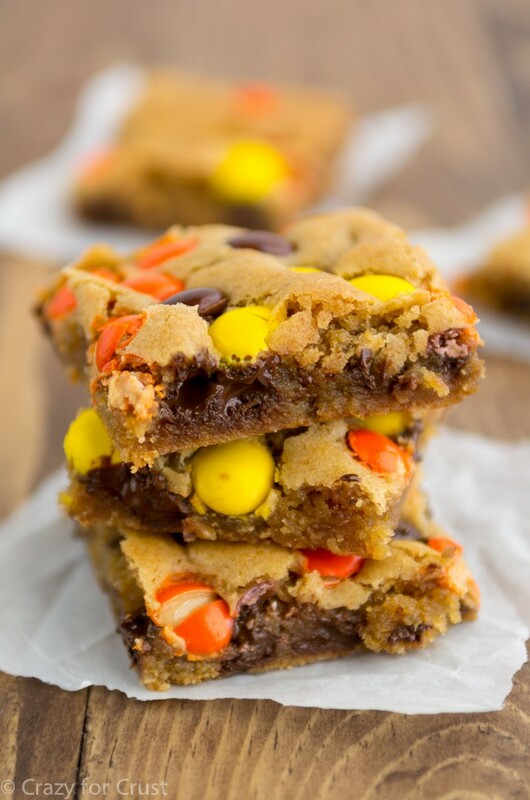 I used Reese’s Pieces, but you can use whatever you like (M&Ms would also be pretty). Bake for 22-28 minutes, until just lightly golden around the edges. It will still be doughy looking in the center. They will finish cooking in the pan - you want them underdone when you remove them from the oven. Cool before slicing. Store in an airtight container up to 1 week or freeze for up to 3 months. Haley, I hope you have a wonderful time! And Dorothy, these look amazing as usual! Yum!!! I love brown butter. I recently discovered it and now I’m addicted! These are wonderful (I speak from experience)! Have a great trip, Haley. OMGeeeee these make me wanna face plant into the screen trying to eat them! Yummmm! I still can’t believe you guys live so close together. Small (blogging) world! Also Dorothy, I’m so glad that you, the dessert master herself, admitted to not knowing whether it’s brown or browned because I never know what to put either.